Leaving Los Angeles on a Monday morning, bound for Reno, NV where I was due on Thursday, I made Soledad Canyon off the 14 freeway my first stop. I had come to this area, sandwiched between the San Gabriel Mtns and the Sierra Pelona for two objectives, the Magic Mtn Wilderness HP south of the canyon and Vasquez Rocks to the north. As sometimes happens my mood shifted upon arrival and I ended up doing something completely different, choosing instead to do a number of shorter outings to mostly unnamed summits on the north side of the canyon. I finished up in early afternoon, giving me plenty of time to head north for a good chunk of the driving that would take me north towards Reno. What enticed me to visit this peak was the chance to hike a new section of the PCT I'd never been on before. Starting from the Indian Canyon TH where the PCT exits the San Gabriel Mtns, the trail continues north across Soledad Canyon Rd, through a grassy stretch that acts as the flood plain for the Santa Clara River, an easy crossing of the river (all but dry at this point), over the railroad tracks that parallel the canyon, and then up through the low hills that characterize this portion of the Transverse Ranges. Peak 3,166ft is little more than a mile and a half from Soledad Canyon, the PCT passing across its eastern flank. There are three summits vying to be the highpoint and initially I assumed the northern point was the highest since it was identified as such on LoJ. However, upon leaving the trail to climb the short distance up to the middle summit, I could see that the north summit was of almost equal height and the south summit was obviously higher than the other two, by more than 20ft. The extra contour of the north summit on the topo map must be an error. I backtracked to the south summit where I found a cross, or "X" made of stones marking the highpoint. I took notice of two other summits from the top of Peak 3,166ft that I thought warranted further attention. A mile to the west was Three Sisters Rock, a collection of rock outcrops that I had first noted from Soledad Canyon during the drive to the TH. I had thought maybe I could combine it with my visit to Peak 3,166ft, but that did not look possible now. I could see that the middle rock was the highest, but there was no side that did not appear vertical, rising 30ft or more. I would have to do more research on this one before paying a visit, likely with climbing gear. To the east rose Parker Mtn, the highest point between Soledad Canyon to the south and SR14 to the north. It sports more than 750ft of prominence and I recalled having noted this on some of my past map searches. I hadn't done any research ahead of time, but perhaps I could find a way up today. I returned back to the PCT and then to the Indian Canyon TH by 9a, having spent about an hour and half on the effort. I drove east and north along Soledad Canyon Rd to the small community of Acton in Crown Valley, just south of SR14. A first effort to find a way to Parker Mtn Rd from the east was rebuffed as the road I followed ran into private property. Back in Acton, I grabbed a large soda at the McD's just north of the highway and spotted Peak 3,589ft a short distance to the northeast, momentarily distracting me. It seemed an easy bonus while I was here, so I continued north through a neighborhood west of the summit, then east on dirt Bandell St until I was on the NE side of the summit, less than a quarter mile away. There were no fences nor signs indicating private property as I started up the steep slope found on that side. An informal equestrian trail appears to circle the hill which I crossed as I headed up cross-country. The hillsides were greener than I'd seen elsewhere in the past few days, with an abundance of flowers on the northern aspect and some colorful cacti blooms near the summit. It took just over 10min to climb the short distance to the top where a white metal memorial cross graces the summit with a view overlooking Acton to the SW. I noted good use trails going over the summit from the east and southwest. On the way down I started down the east side trail, but once I realized it was heading off away from the car, I abandoned it for the shorter, more direct cross-country route. From the summit of Peak 3,589ft I had spotted the dirt road leading to Parker Mtn and with the help of my GPSr found the way to reach it. Back in Acton I refreshed my soda (it was getting pretty warm outside by this time) and headed to paved Escondido Canyon Rd and paved-becoming-dirt Hubbard Rd. The dirt portion was in excellent condition and easily driveable. I turned left at the first junction (Google Maps has it as Hughet Pin Rd, but I don't recall it signed as such) which climbs steeply to Parker's N/NW Ridge about a mile and a half from the summit. A high clearance vehicle can drive all the way to the summit on Parker Mtn Rd but it would have been too dicey for my van, so I found a place to park and hoofed it from there. It's a pretty easy hike and fairly enjoyable too, with views alternating off one side and another as the road winds its way towards the top. There are several intermediate bumps along the way that have found their way on peakbagger.com, not really summits, but minor bonuses if one wants to pad their PB stats (Pt. 3,495ft and Pt. 3,815ft). These can be reached by use trails or spurs off the main road. In such situations I try to follow the mantra, WWLND (What would Laura Newman Do?) I ignored them on the way up, tagging them on the way down. Parker Mtn's summit has a concrete pad at the the highpoint, all that remains of a lookout tower that once stood here. It's a very nice viewspot to take in the surrounding chaparral and scrub-covered hills. Even in Spring of an El Nino year the area is very desert-like, much like most of the Mojave found just over Soledad Pass to the northeast. I returned to the van, drank down the remainder of my soda and then continued west across the road to climb to bonus Peak 3,660ft with just over 300ft of prominence. 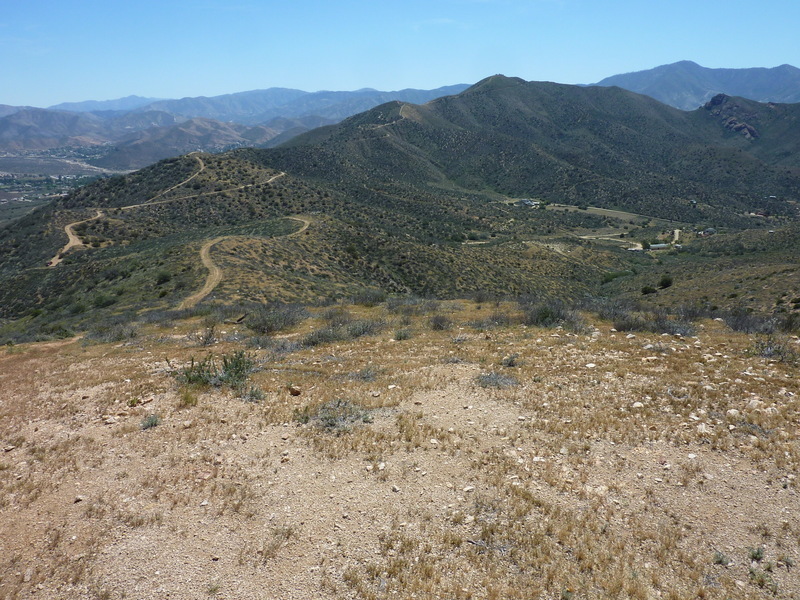 Another short climb of perhaps 1/3mi, it took just over ten minutes to reach the highpoint where one finds an LA County benchmark and a good view of Parker Mtn to the southeast. A rough dirt road leads to the top from the saddle where I had parked. Other tracks lead to the top from the northwest and south.